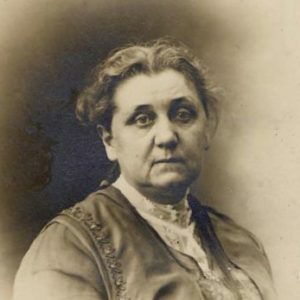 Jane Addams, ca.  1915 (Swarthmore Peace Collection). 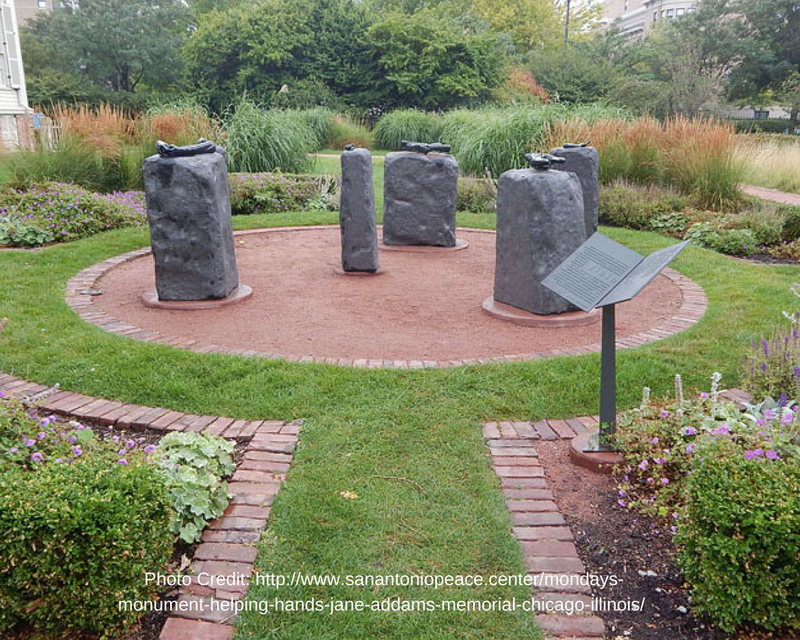 Jane Addams was the first American woman to win the Nobel Peace Prize for her efforts in the peace movement and social work, but who were the other women who have won the prize? Learn a little bit about each of the 16 total women winners and when they won their prizes. Bertha von Suttner (1905)- Born in Austria-Hungary, she was a pacifist and novelist. She worked as a secretary for Alfred Nobel in 1876, but only a few months later quit her job and got married in Vienna. She kept in touch with Nobel and was not shy to share her objections of dynamites used for military purposes. She actively worked in the Austria and Germany peace movement and was awarded the Nobel Peace PRize by the Norwegian Nobel Committee after her death in 1889. 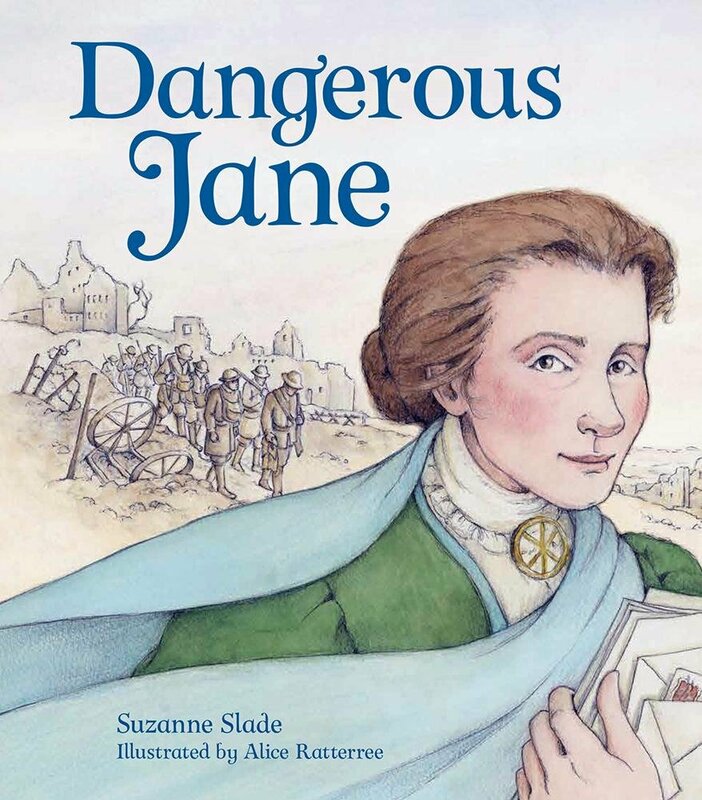 Jane Addams (1931)- An Illinois native, Jane Addams was a novel pacifist, suffragist, and trailblazer in social work. 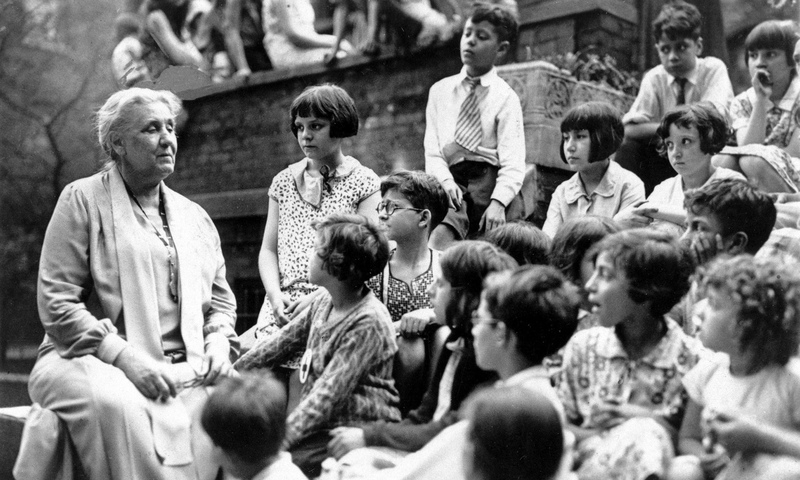 She is known as the mother of social work, with her discovery of Hull House being a symbol of a way to “provide a center for a higher civic and social life; to institute and maintain educational and philanthropic enterprises and to investigate and improve the conditions in the industrial districts of Chicago.” She was also the first president of the Women’s International League for Peace and Freedom (WILPF) Addams won the Nobel Peace Prize in 1931. Emily Greene Balch (1946): Balch was born in Boston and was an American economist, sociologist, and pacifist. She always had an interest in social issues like poverty, immigration, and child labor and worked to reduce juvenile delinquency and aide poor immigrants. 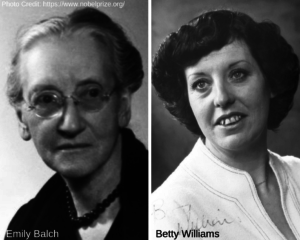 Balch collaborated with Jane Addams at the start of WWI and the two worked for the WILPF, with Balch’s work giving her the Nobel Peace Prize in 1946. 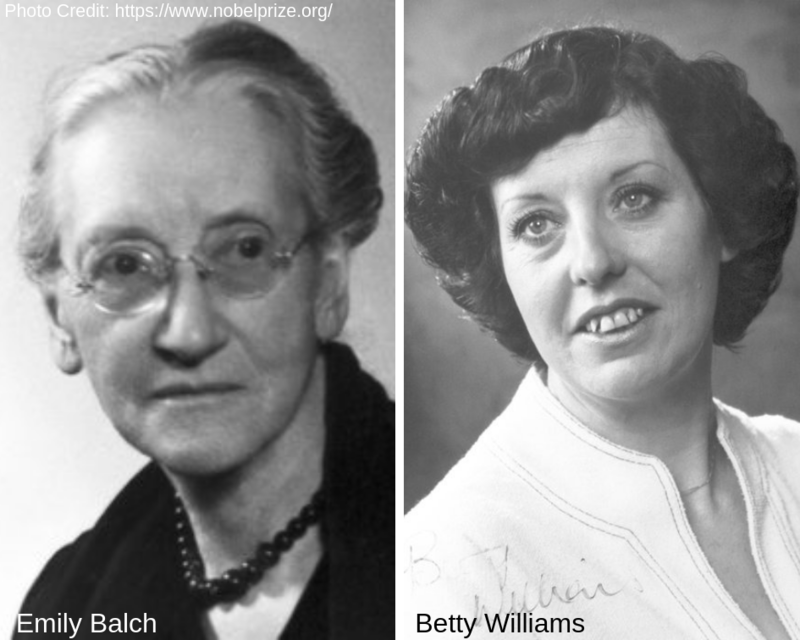 Betty Williams (1976): Irish native Betty Williams was the Founder of the Northern Ireland Peace Movement, later renamed Community of Peace People. In the early 1970s, Williams joined an anti-violence campaign and grew interested in the grass-roots campaigning for peace and non-violence in Ireland. She won the Nobel Peace Prize in 1976 and is currently in charge of the World centers of Compassion for Children International. Mairead Corrigan (1976): Corrigan shares the Nobel Peace Prize with Williams and won her prize for her efforts in ending violence in Northern Ireland. When the Irish people became discouraged in the Peace People, Corrigan kept her hopes up and continued to support the cause with admirable devotion. Corrigan was also a founder of the Northern Ireland Peace Movement. Mother Teresa (1979): Born in Macedonia, at the time the Ottoman Empire, Mother Teresa got her call to God at the age of 12 and knew she was destined to spread the love of Christ. She dedicated her life to helping the poor; she built homes for orphans, nursing homes for lepers and hospice for the terminally ill in Calcutta. She created the Missionaries of Charity and in 2003, the Pope began her canonization and was declared a saint by Pope Francis in 2016. Alva Myrdal (1982): The Swedish native was an advocate of disarmament and was a diplomat, writer, and former Cabinet Minister in Sweden. She was also a campaigner for women’s rights and after WWII, Myrdal held prominent posts in the United Nations. In 1955, she was the Swedish Ambassador to India. She worked extensively to persuade world leaders to disarm and fought for nuclear weapons-free zones in Europe. Aung San Suu Kyi (1991): Born in Burma, she won the Nobel Peace Prize “for her non-violent struggle for democracy and human rights.” She lead the opposition to the military junta that controlled Burma in 1962 and was a founder of the National League for Democracy (NLD). Inspired by Mahatma Gandhi, she opposed all violence and called on leaders to give power to a civilian government. The military rule arrested members of the NLD, including her, yet the Peace Prize had a significant impact on her house arrest, that was supposed to last 21 years but only lasted almost 15 years. Aung San Suu Kyi won the Nobel Peace Prize in 1991. Rigoberta Menchú (1992): The Guatemala native was raised by an poor Indian peasant family and helped work on the family farm.  She became involved in social reform through the Catholic Church and was a prominent figure in women’s right in her teen years. She continues to work for the rights of indigenous peoples, with the Nobel Peace Prize motivation being “in recognition of her work for social justice and ethno-cultural reconciliation based on respect for the rights of indigenous peoples.” She became a UN Ambassador for the world’ indigenous peoples. Jody Wlliams (1997): American pacifist Jody Williams always was interested in international politics and relations and was interested in war-torn El Salvador during the 1980s. She became interested in landmines and the serious threat they posed, so she become a trailblazer of an international campaign against landmines. By 1997, the International Campaign for Ban Landmines (ICBL) included 1,000 organizations and 60 countries as members. The Ottawa Convention will forever be associated with Williams, which banned the use, production, sale and stock-iling of anti-personnel mines. She was awarded the Nobel Peace Prize in 1997. Shirin Ebadi (2003): Shirin Ebadi was born in Iran and was Iran’s first female judge. She defended people who were persecuted by authorities and in 2000 she was imprisoned for critizicing her country’s hierocracy. She became interested in fundamental human rights, specifically women’s and children’s rights and soon became and advocate for the separation of church and state in Iran. She won the Nobel Peace Prize in 2003 “for her efforts for democracy and human rights. She has focused especially on the struggle for the rights of women and children.” The Nobel Committee attempted to heal tensions between the Islamic and Western Worlds after the September 2001 attacks in the United States, while lend a hand in the Iranian reform movement. Wangari Muta Maathai (2004):Wangari Muta Maathai was born in Kenya and opposed Daniel arap Moi’s regime and advocated for democracy in Kenya. After obtaining her doctorate in biology and being the first female professor ever in Kenya, she started the grass-roots movement at countering deforestation. She started the Green Belt movement and contributed to the planting of over thirty million trees. She was the first African women to receive the Nobel Peace Prize in 2004. 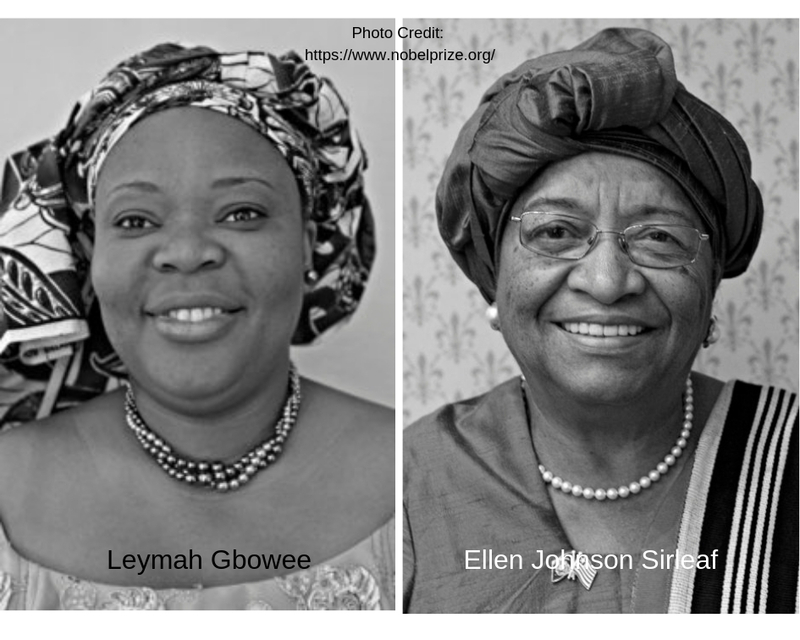 Leymah Gbowee (2011): Alongside Ellen Johnson Sirleaf, Leymah Gbowee won the prize in 2011, with the two sharing the same goals of peace in Liberia. Since 1989, she calls for women to come together, regardless of ethnic and religious backgrounds, to obtain peace. 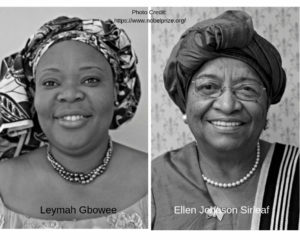 After raising enough money, she led a delegation of Liberian women to Ghana to pressure peace-talks, which contributed to ending the war. Tawakkol Karman (2011): Born in Yemen, Karman shared the 2011 Nobel Peace Prize for the non-violent struggle in protecting women’s safety and building women’s rights along with peace-building efforts. In 2005, she founded Women Journalists Without Chains to promote freedom of expression and democratic rights and was an active participant in the 2011 protests that took place in numerous Arab countries. Malala Yousafzai (2014): Malala Yousafzai is the younger person ever to win the Nobel Peace Prize, at 16 years old. She was born in Pakistan and would blog for BBC since 2009 about her personal experiences with the Taliban’s growing influence and power. In 2012, the Taliban attempted to kill her, but after numerous surgeries in the UK she survived and still lives in the UK. She is known for her courage and dedication for the rights of girls to education.